I have a small kitchen without a lot of cupboard space, but given the state of affairs in the world these days, we've decided it's probably a good idea to start prepping. I bought 4 of these to make shelving units to hold dehydrated and canned foods. I left the back off of one unit, sliding two units together, creating a deep shelving unit that holds a lot of canning jars. They fit perfectly under a cabinet that I have a cute curtain in front of. Out of site, out of mind. These seem very sturdy and are close to being filled and holding up very well. I am concerned about the weight of canned food, so I have the dehydrated foods on the top shelves and most of the canned foods on the bottom shelves. I do have a few canned items on the top shelves. I haven't seen any signs of buckling or warping. I ordered them in black so it would be a dark, cool place to keep the food. 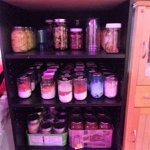 Very inexpensive way to create a nice little prepper pantry. I'm very happy with these bookcases, I've moved into a small apartment with virtually no storage, so these bookcases are perfect, I've purchased another taller one because I was so pleased. They are really easy to assemble, I'm elderly and put these together in less than 30 minutes. Amazing value! Great product for the price. 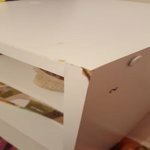 Typical mdf assembly yourself furniture. Assembly was easy. Realize this though. Because I wanted to use the shelves for books and binders as tall as 12 inches, I could only use it as a two shelf unit. In other words, if you want to use it as a three shelf unit, the books will have to be really short. The measurement from the bottom shelf surface to the underside of the top is 27.5". 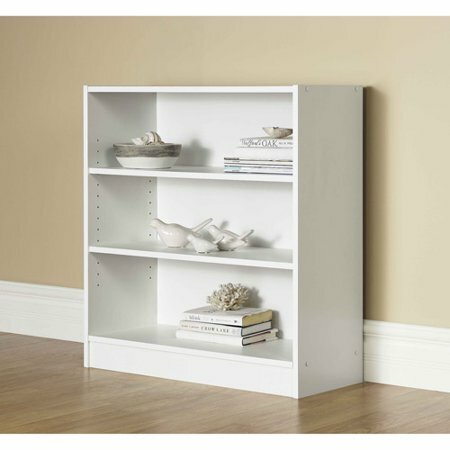 Subtract from that 1" for the thickness of two movable shelves, and you have 26.5" height to divide into thee spaces. As such, is working great and looks nice as a two shelf unit for me. 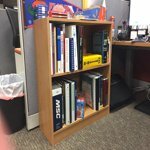 Acually, because I'm using it for big heavy books, I'm going to cut the third shelf I couldn't use and place it as a vertical support under the movable shelf to prevent the inevitable sagging that will come with heavy loads on these particle board shelves. Good quality for price. Got for daughters room so didnt need any thing fancy. Pretty easy to put together. Only negative was there were not enough nails for the back board so i had to use some i had or it would have looked bad. 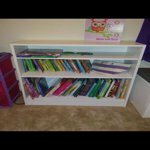 I needed an inexpensive bookcase for my craft room. At $22.00, I bought 2. The only cons are: 1. It's supposed to have 18 nails to attach the back panel to the bookcase, both only contained 10 nails. 2. The shelves are not 12" deep as it states in the description, it's 11½" inches deep, so my trays hang over the edge a bit. They do look nice and and I am happy with them. 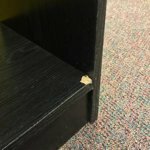 Just be sure to buy some extra nails because they add strength and keep the bookcase sturdy. 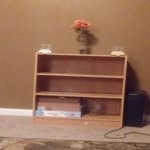 I bought two bookcases. The first one I assembled without a hitch. The pieces of the second one were labeled incorrectly (two pieces were labeled #4 and should have been #3. It took be a long time to figure it out and I almost went to the trouble of sending it back, but when I did figure it out, I was able to finish it quickly. When I went to put books in the shelves I found that many books did not fit if I tried to space the shelves evenly, and making one of them of a smaller height meant that that smaller one was too small for even most paperbacks. I have other 3 shelf bookcases of the same height, but they don't have the kickplate and the bottom and they can accomodate taller books. Recently purchased two of these and had them delivered. Exterior packaging was damaged and the shipping handler had to reseal packaging to retain assembly hardware. The finished surfaces had damage likely from the factory as the damaged surfaces faced inside. I would not recommend purchasing this product as both of the units purchased had damage. I can't believe I paid so much for these shelves! I bought 3 of them to use in my classroom. I chose them over the less expensive ones because they have holes going the full length and I needed room for 3-ring binders. 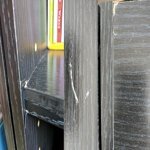 The laminate was chipped around the pre-drilled holes, the edges were chipped, and there was a big chunk missing on one of the bottom shelves. I'm very disappointed in them but decided to use them anyway because school is starting and I needed to finish putting my classroom together. If I had more time, I would have definitely returned them. First, the picture online has a back to the piece. Ours did not come with the back. Second, the corners are chipped and the white is off. Last, I have reached out to the extended warranty and that's a joke. I have to fax them proof of warranty, which has been given to start the claim. It at best is worth 10 bucks.